Because of a very potent plant virus found in tobacco products we ask that no tobacco of any kind come onto the property and if you are a tobacco user please refrain from using tobacco before you come and please wear clean clothes that you haven’t used tobacco in. We know this seems a bit odd but a number of small lavender farms have lost their entire farms because one person carried this virus onto their farms. The tobacco mosaic virus is particularly deadly to lavender plants. Thank you for taking this seriously. Sofia Community is a place for meditation, yoga, renewal, art, and working with the earth. We allow limited visitors to come join us in these pursuits. Because Sofia is quite unique we wanted to share a few things for you to get a sense of what we do before you arrive. ​* We are in the initial phases of getting established which means we are quite small with residence numbers being anywhere from 0-12. Yes, if you are here for an extended stay you may have a night or two where you have the place to yourself. Be prepared to embrace the solitude. * We ask all visitors to join in our daily schedule: This includes 2 meditation times a day and 2-4 hours of work on the land a day. A typical day looks like this. * If you are interested in a specific meditation, gardening, or healing/recuperation retreat we can help you design a schedule that works for you. We are a working lavender farm and usually have more to do in any given day then hours allow. While we are often torn with wanting to spend time catching up with old friends and meeting new ones please understand if we limit our time visiting. But just because we have to go back to work doesn't mean you have to leave. Feel free to enjoy the space for as long as you'd like, take a walk, read, take a nap in the hammock, etc. We do also invite friends to come work with us in our daily chores, which can often be a fruitful and meaningful way of visiting together. For friends wishing to stay for one or multiple days and to enjoy the space and sanctuary of the lavender farm we offer the following two step process. Thank you for your work and generosity as it greatly helps us to continue offering this space to almost 100 people a year. ​First 1-3 days = $40 a day + 2 hour of yard work or chores a day (gardening, sweeping, etc) This is for camping and use of the property. (If we have other housing free you are welcome to use that). After 3 days its $10 a day plus 3-4 hours of work on the farm. (Or you are welcome to keep going with the arrangement for the initial 3 days.) Farm work can be designed to stay in the limits of your personal abilities. Please refrain from wearing perfumes and strong fragranced deodorants while visiting us. Some of us have sensitivity to chemical fragrances. 100% pure natural plant essential oil fragrances are fine in small doses. A number of our plants are culinary lavender and because the fields are not fenced off and because dogs love to pee and go to the bathroom on lavender bushes we ask sadly that you leave them at home. They have in the past also caused damage to things like thin drip tape and neighbors chickens. So sadly for us we are presently a dog-free farm. Sorry for the inconvenience. We ask that all computers and cell phone use be shut down by 8pm for the night. And we ask that you refrain from movies and entertainment videos while on the property. Educational and instructional videos are the exception for long term residents. Our goal is to make this a sacred place and while we love movies and videos the idea of having this land be a place where we refrain from that has had a surprisingly beneficial effect on our minds and hearts and so we ask you to please help us to keep this kind of sacredness here. We do two short communal meditations at the farm and ask everyone staying here to join in this practice. There are opportunities for longer sits throughout the day, as you like, but communally we simply do a 30 min sit at 8am and a short sit and evening prayers/metta practice at 8pm. After the evening sit we are silent together (excluding emergencies or any non emergency concerns or needs. i.e. please don't hesitate to break silence if you need any thing at all!) until the morning sit. Please join us in this and enjoy the rare spaciousness of a little silent time together. Feel free to inquire about the weekly schedule and upon your arrival we will also go over the seasonal meditation and meeting schedule with you. We ask all visitors and residents to please refrain from all alcohol and drug use while on the property and to please not come onto the property if under the influence of alcohol or drugs. We have a woodshop, (soon a library) a little writing hut, and the meditation and yoga temple. Please feel free to use these spaces. Outside of formal meditation times the temple is open for you to use for meditation, yoga, dancing, resting or reading. Please enjoy yourself and use this beautiful land and space to refresh and rejuvenate your heart and mind. We are a vegetarian farm with occasional use of fish. We try and do communal meals when feasible but please plan to bring any food you'll need. (There are ample grocery stores in Prescott 20 miles away) We have basic staples of oils, condiments, grains, beans, etc, that you are welcome to. Please be prepared to be self-entertained while here. Sofia/Skull Valley Lavender Farm is a wonderful place to read, journal, paint, walk, do yoga and meditate. Often we have to go into town for errands or to spend the night in town so you may be out here alone at times. Presently we only have very primitive housing for friends visiting. Please strip and remake your bed when you leave with fresh linens. (We can show you where to find these.) Put all dirty linens in the laundry room. We have a tent platform and ground space to put tents. We also have space for car camping but no electrical or sewage hook-ups. 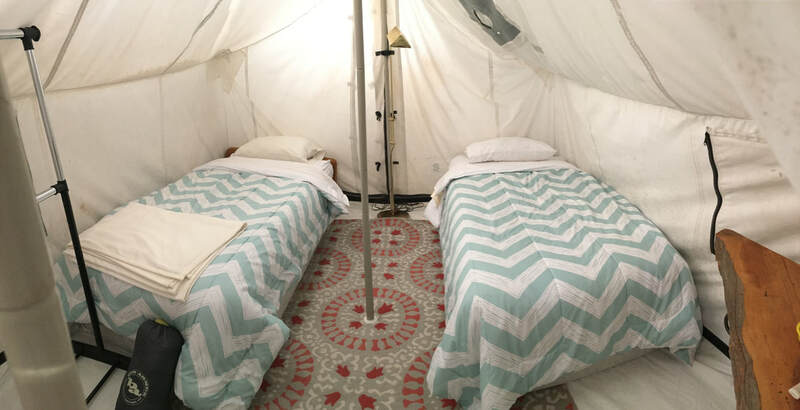 ​The Margie Tent: This is a rustic wall tent in the horse barn. 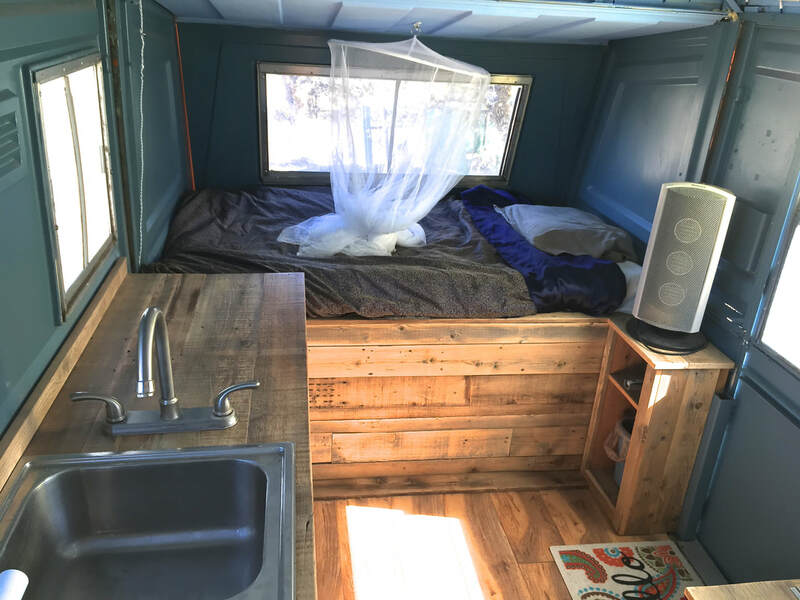 This has a carpet, two beds and electricity for a light and small heater. Full disclosure: about 1 out of 10 people who stay here complain of a slight moldy smell as the tent is quite old. I however sleep in here on occasion and fully enjoy it. ​The Sara Trailer: – The Sara Trailer is a small pop up trailer with two beds and a fold up table. R.V.s: – We have a tight driveway that cannot fit most RVs. However we live on the edge of national forest where you are allowed to park RVs and camp. Just right down the road is an easily accessible area where people often pull in their RVs for a day or two. Currently the Sofia community is under construction to repair our old buildings. This means there are loose nails, boards and all kinds of dangerous hazards lying around. Please be forewarned and come here at your own risk and be careful as you work or visit here as sharp objects, uneven ground, loose wood, and general dangerous conditions are all around. Please also note that bees, stinging insects, poisonous snakes, javelina and large cats are all found here. We have a first aid kit above the washing machine where we also have an Epi Pen if anyone should have an allergic reaction to a sting. The closest hospital is Yavapai Regional Medical Center. Take a right out the drive way and take that all the way (3.5 miles) until it dead-ends onto the main paved road (Iron Spring Rd). Take a left and in about 15 miles you will see the hospital on the left at a major 4-way intersection.